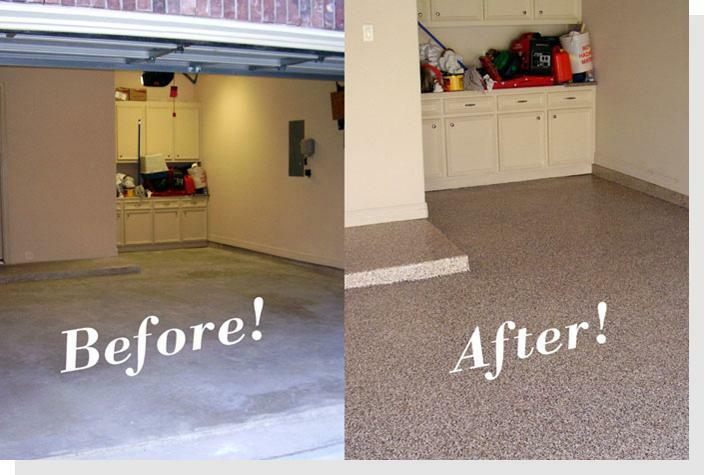 Aardvark Painting is your Chicago Epoxy Flooring Contractors specializing in all types of Decorative Epoxy floors including flake/Chip Epoxy floorshave become a popular choice to transform an oil stained garage into a living space impervious to all auto fluids. Our Epoxy floor process utilizes advanced formulation epoxies, urethanes and colored vinyl flakes/chips to cover any concrete surface with a granite-like finish. This process is now being applied in garages, showrooms, grocery stores and any other place you want concrete sealed permanently. We use only the finest 100% Solid Epoxy products with zero VOC (Volatical Organic Content) and applies them with uncompromised surface preparation and installation. Our process always begins with preparing the surface by Diamond grinding or Shot blasting is process is the most important part of the job and often not performed by shoddy or inexperienced contractors, call Aardvark Painting Your premier Chicago Epoxy flooring Contractor. Epoxy flake floors have become a popular choice to transform an oil stained garage into a living space impervious to all auto fluids. Our process utilizes advanced formulation epoxies, urethanes and colored vinyl flakes to cover any concrete surface with a granite-like finish. This process is now being applied in garages, showrooms, schools and any other place you want concrete sealed permanently. We use only the finest 100% Solids Epoxy products with Low or zero VOC (Volatical Organic Content) that comply with the EPA and U.S. Green Initiative.Epoxy floor coatings are becoming increasingly more popular in commercial facilities. Whether you have an existing building or a new construction property we can service your flooring needs. There are many advantages to the epoxy systems that you won’t find with your traditional concrete or tile flooring. Our coatings are both durable and easy to maintain. There are a variety of systems available ranging from basic epoxy to decorative quartz, trowel down, conductive, and chemical resistant and new Reflective epoxy floors. Durability: One of the best qualities of Epoxy Floors flooring is its durability and resistance to wear and tear. Chicago Epoxy Floors floors offer all of the durability of Epoxy flooring including high compressive strengths. They will also not warp, buckle, or flake like some other flooring options. Additionally, stained concrete floors are ultraviolet light resistant to resist fading or discoloration. Finally, unlike some concrete paints, concrete Epoxy will not chip or peel like cheap paints. Beauty: Properly designed and installed Epoxy flooring is capable of capturing the look of far more expensive flooring options including granite, marble, travertine, sandstone, flagstone, and slate. This can give your flooring an elegant and stylish look at an affordable cost. Even single color Epoxy Floors can provide a unique look, allowing them to stand out beyond any commercial or industrial application. Energy Savings: Concrete floors have an ability to absorb, store, and slowly release heat and coolness. Because of this “thermal mass” property, Epoxy Floors can reduce the load on heating and air conditioning equipment by moderating indoor temperature swings while outdoor temperatures may vary drastically. Low Maintenance: Epoxy Floors require very little maintenance compared to other flooring options. These floors can simply be swept and mopped clean as needed while maintaining their overall look and elegance. Occasionally, Epoxy Floors in high traffic areas may need to be buffed or repolished to maintain their shine. Optimal Indoor Air Quality: The four main sources of indoor air quality are (1) allergens, such as dust mites, mold, mildew; (2) retained moisture and dampness; (3) odors from smoke and cleaning agents; and (4) volatile organic compounds (VOC’s) emitted from some building materials. Epoxy Floors eliminate all of these indoor air quality problems because they do not allow for the growth of mold and mildew, will not collect dust mites, easily allow moisture to evaporate, can be cleaned easily without harsh chemicals, and can be installed with a sealer that contains low or no VOC’s. Water Resistance: Stained concrete floors allow low amounts of moisture to pass through without leaving behind any negative results or effects. Epoxy Floors will not warp or rot, grow mold or mildew, or discolor like many other flooring surfaces when exposed to moisture from above or below. Sustainability: There is an important and recent trend towards using environmentally friendly and sustainable building materials and methods when building and remodeling commercial and industrial buildings. Because concrete is energy efficient to product, is made from local products, and uses recycled or waste products when manufactured stained concrete floors are a sustainable building material. Other environmental benefits of stained concrete floors are that they promote optimal indoor air quality, reduce operating costs, have little construction waste, and will not ever need to be replaced. Solvent Free — No VOC’s. Super Easy Clean up and Maintenance. Non-slip Surface preventing slip-fall accidents. Cure Time (8 to 24 hrs). Satin Finish to High Gloss. Non-carcinogenic, USDA and FDA approved. 10 Year to Lifetime Warranty.